This buckle set includes a Textured Basket Weave in Sterling Silver finish. 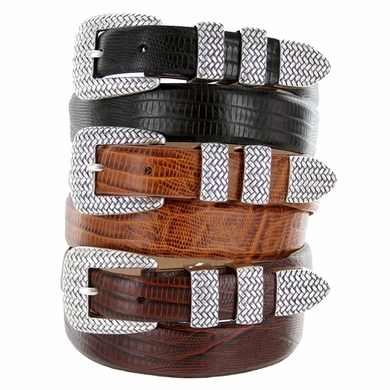 Shown on our Lizard Grain Italian Leather belt, also available in Alligator Grain and Smooth Leather. 1 1/8" wide tapering to 1" width. Sizes Available from 32" thru 54".